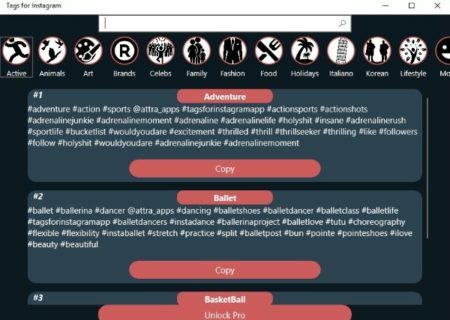 This article covers 5 free Windows 10 hashtag generator apps for social media. Everyone on social media these days loves to have lot of followers and likes on their posts or images. Be it on Facebook, Twitter, or Instagram everyone wants to be popular. One of the ways that you can gain more likes is by selecting the right hashtags for your posts. If you have relevant or trending hashtags attached with your posts then possibilities are that your posts would be more visible. 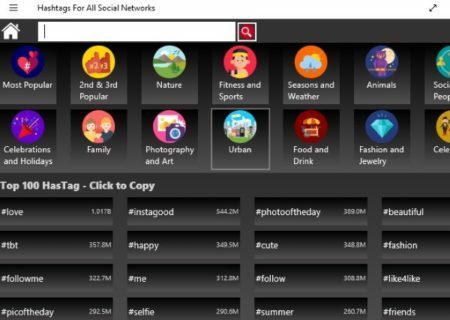 For getting the right hashtags for your posts, we will be using these free Windows 10 apps. All the apps mentioned here are free to download. All of them give you suggestions from popular hashtags. You can either copy all of them or copy just the ones that you want. 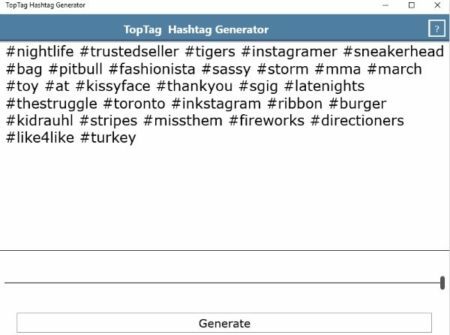 Let’s look at these free Windows 10 hashtag generator apps for social media below. 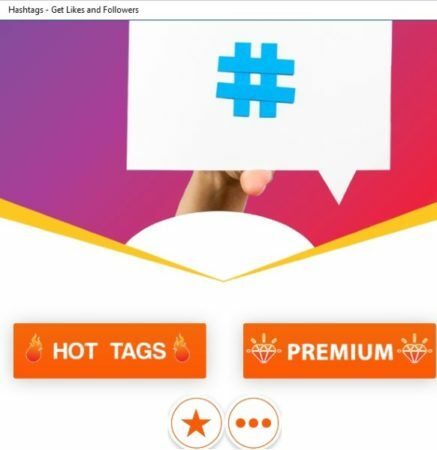 Hashtags – get likes and followers is a nice app to get popular hashtags to post on your social media accounts. This app is currently available for free, so grab it before the offer goes away. In this app, you will get a home page like the one seen in the above screenshot. The premium section is of course the paid one. So we will go to the hot tags button. This button will bring up the categories under which hashtags are available. Some of these categories are unlocked while some are locked and available with the paid version. 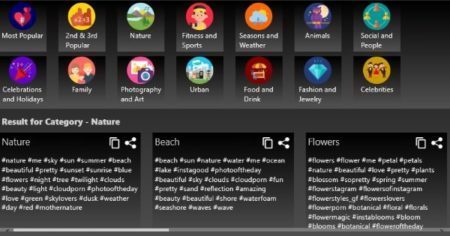 The unlocked categories are as following; popular, animals, family, food, entertainment, sports, nature, social, art, and fashion. You can click on any category to view its subcategories along with hashtags of them. The popular hashtags category screenshot can be seen above. You can see icons below the generated hashtags, these are for directly posting to respective social media accounts. You can even copy the hashtags using the first copy icon and then paste the hashtags anywhere you like. Similarly, you can explore all the categories and choose the hashtags that you want. 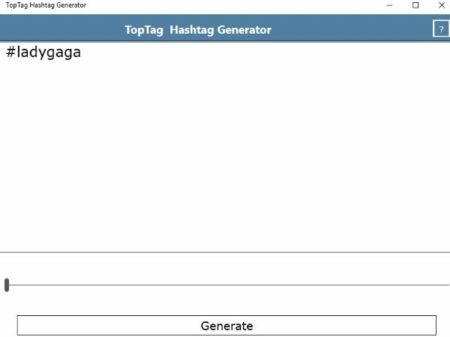 TopTag Hashtag Generator is a nice hashtag generator for Windows 10. In this app you will see an interface like the one in the screenshot above when you start this app. The top box is where the hashtags would be generated. The slider is for choosing how many hashtags you would like to generate. The maximum number of hashtags that can be generated are 30 at a time. The generate button will generate random hashtags from popular hashtags on social media. This can be seen in the below screenshot. In the above screen, I had selected the maximum 30 hashtags using the slider. Now you can easily copy these hashtags. You can copy all of them, or you can copy only selected ones. Once copied, they can be posted on any social networking website. Hashtags for Social Media is another good app for generating hashtags. When you start this app you will get a button on home screen which says hot hashtags. Click this button and you will be taken to the above categories page. From this page you can browse through various categories and choose the one that you want. Various categories that are available are business, technology, beauty, fitness, couples, pets, drinks, health, popular, nature, weather, animals, holidays, family, etc. Choose a category and the hashtags available in it will open up in front of you, as can be seen in the screenshot below. 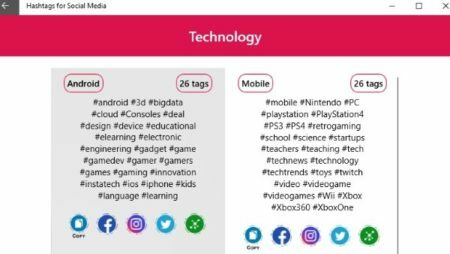 This page would list all the hashtags related to that category. Like in the above screenshot, there are 2 sub-categories for the technology tab which are Android, and mobile. At the bottom of these hashtags you have option to copy these hashtags and paste them anywhere you need. Otherwise, you can use the other icons to paste the hashtags to a social media account. Hashtags – get likes, followers for Facebook, Instagram, and all social networks. This app gives you an interface like the one shown above. There are lots of categories under which the hashtags have been divided. These categories are; urban, family, food & drink, nature, most popular, animals, etc. Below the categories you will see random hashtags which can be copied right from this page. When you open up a category page, you will see hashtags related to this category. This can be seen in the above screenshot. I clicked on the category nature and hashtags related to it opened up. You can easily copy or share these hashtags and use them on any of your social media accounts. Tags for Instagram is a nice hashtags generator app. Though its says tags for Instagram, but you can use these tags in other social media accounts as well. When you start this app you will see an interface like the one seen in the screenshot above. The categories under which you can search are given at the top of the app window. When you select a category the hashtags related to it will be displayed in the same window below the categories. Each hashtag sub-category will have a copy button given at the end of it. You can easily click this button and copy the hashtags. Now you can use these hashtags anywhere you like. You can read a detailed review of this app here. These are some nice free Windows 10 hashtag generator apps for social media. 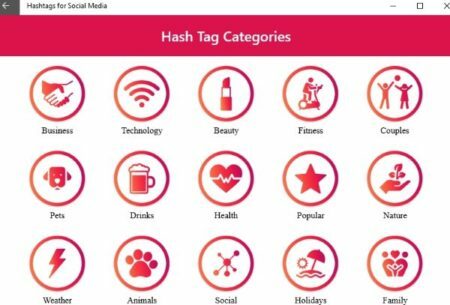 You can use these apps to generate random hashtags from popular category. All these apps have lots of categories under which hashtags are available. You can easily copy these hashtags and use them in any of your social media accounts. Try these apps out.